January 11 was the last day of work for 27 janitors and grounds keepers at the University of Wisconsin-Superior. They lost their jobs after a dramatic nine month battle with university administrators. Like many colleges across the state of Wisconsin, the University of Wisconsin-Superior is facing a major budget crisis. This is largely due to massive cuts to higher education funding by the Republican Governor Scot Walker, and his Democratic predecessor, Jim Doyle. But the budget crisis was also caused by the construction of a slew of new buildings over the last several years, including an expensive new student center, despite opposition from students. UWS administrators choose to try to balance their budget on the backs of the lowest paid, and most vulnerable workers on campus. In the Spring of 2014 they announced that they were going to explore outsourcing the university's entire custodian and grounds keeping department to the lowest bidder. This, despite the fact that the over-worked campus janitors only made $11-$14/hour to begin with. Worker and community members sprang immediately sprang into action to demand that the college reverse course. Spearheaded by AFSCME, which represents the janitors, the AFT, which represents the faculty, and members of Socialist Action, a broad coalition was pulled together. A mass letter writing campaign was launched, followed by a petition drive in which several thousand people signed on it support of the threatened janitors. Supporters reached out to local officials and community organizations, and were able to get the City Council of Superior and the Douglas County Board, together with numerous union locals and other groups, to pass resolutions against the proposed outsourcing of jobs. Numerous pickets and other actions were also held. A contingent of janitors and their families marched in the Superior July 4th parade, where they received a standing ovation. 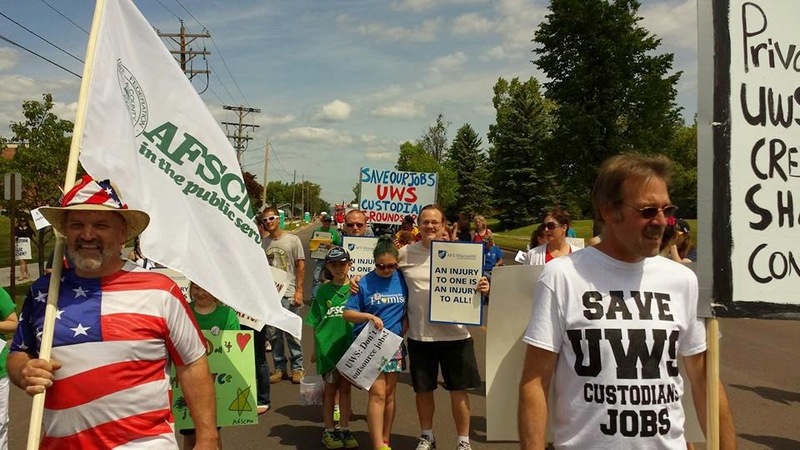 On July 26 over 250 workers from the community and across the state converged on the UWS campus for a march and rally. And finally, in December, a last ditch protest was held at the UWS Chancellor's annual formal fundraising ball. While attendees walked by in tuxedos and fancy dresses, the janitors and their allies chanted and held collection buckets, before later crashing the party itself and singing labor songs. But in the end, despite the overwhelming outpouring of community support, the university went ahead and fired the 27 threatened workers, and brought in an out of state company that is hiring workers at $9 an hour with no benefits to take over. Adding insult to injury, the very same administrators who insisted that they had to cut the janitors' jobs to save money, gave themselves 12% raises! To give you a sense of proportion, each administrator's raise is equal to the entire annual salary of a laid off janitor! The fear is that what happened to the UWS janitors is just the beginning, and that this was just the first campus of a system wide drive to privatize campus custodial departments across the state. It's also not likely to be the end of the cuts at UWS either. Already an announcement has been made by administrators that various majors are being cut, and further staff cuts are in the works. Because of this, the community coalition that came together to try and save the janitors' jobs has announced that it will stay together to fight further cuts and to insist administrators and the state re-adjust their budget priorities. There is more than enough money to not only fully fund higher education, but to expand it and make it free for all. But to do that we need to tax the rich, and put a stop once and for all on these outrageous attacks on working people. The struggle continues! > The article above was written by Adam Ritscher of Socialist Action and United Steelworkers Local 9460.